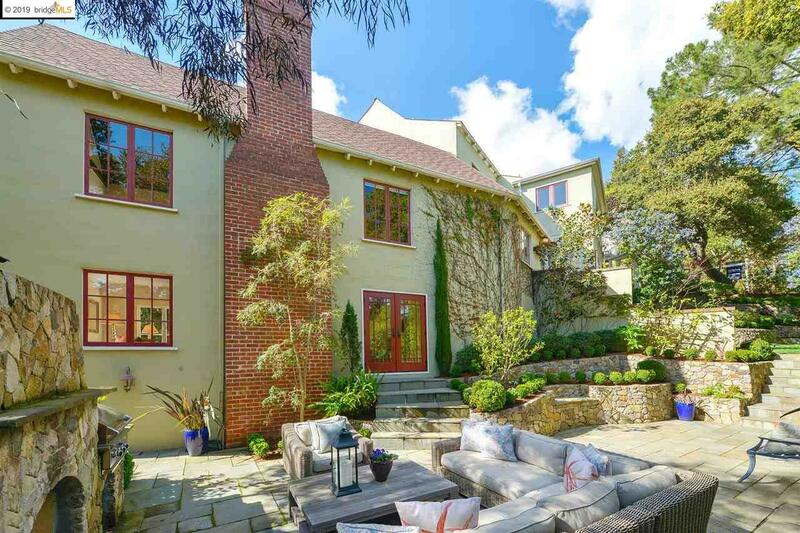 Outlined by an oak grove down a private road is this magical Period estate tucked away on a majestic quarter-acre of grounds in Crocker Highlands. Over the years and to the sum of $700,000, this estate has been lovingly restored and transformed bringing timeless duality to this five-bedroom, three and a half bath retreat-like home and property. Three levels of rustic grandeur include a rich farmhouse kitchen, cathedral-ceiling living room, two family rooms; one on the main level, and the other family room with fireplace on the lower level opens directly onto the professionally landscaped front gardens, outdoor fireplace and sitting areas. Interior dry sauna has a secret door to the hot tub deck surrounded by mature Bay leaf trees.